This is the best recipe for grilling salmon I've ever tasted. My parents have been raving about it for some time, but I was skeptical about anything cooked on a plank! Finally, on a visit home, I tried it and was immediately convinced! This cedar plank salmon recipe is now one of my favorite summer meals! I haven't included quantities in this recipe. This is one of those marvellous "add as much as you like until it looks perfect to you" recipes. Soak the plank in water for 15 minutes. Place the boneless salmon on a plate. Coat it all over with olive oil. Lay the salmon on the plank. Paint the salmon with soy sauce. Sprinkle the salmon with barbecue spice. 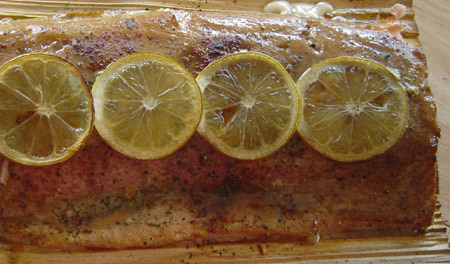 Lay thin slices of lemon on top of the salmon. Lay the plank on your preheated barbecue grill. Barbecue for about 15 or 20 minutes, until the fish is no longer bright pink and flakes easily with a fork. Use tamari in place of the soy sauce. Use your favourite oil in place of the olive oil. Make your own barbecue spice mix. Try using any or all of the following: paprika, curry powder, chili powder, dry mustard, coriander, pepper, salt, oregano, garlic powder and sugar. Try using slices of orange or lime in place of the lemon slices. You may be able to find cedar planks specially packaged for this purpose at the supermarket. Look in the fresh fish section. If not, try a specialty fish shop. Return from recipe for grilling salmon to summer recipes.